I am trying to find a complete replacement engine for my xr80. Factory , aftermarket , Used doesnt matter to me. My engine runs but is very weak. does anyone know if they make a horizontal piston aftermarket engine like the chinese lifen motors? It's tough when the bikes get old. It can cost some cash to rebuild a motor. Sometimes you can part them out and buy a newer bike. They went from point to digital ignition in the late 80',early 90's. I believe​ that's the only difference. yes i found this out. i finally swapped over my engine. runs great. i have to do something with the exhaust tho. it its extremely loud. i am currently trying to make it street legal as the police do not like me out on the streets with it. i have all the swap stuff off a wrecked scooter. 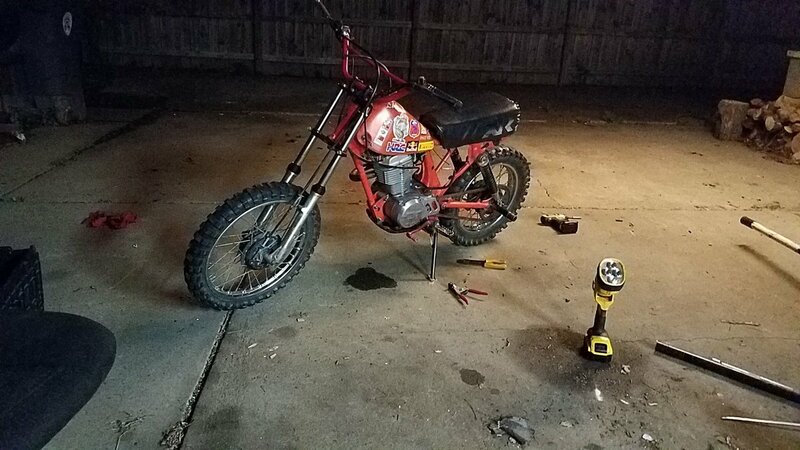 the issue is i need to acquire a title and im not sure how to on a 1983 dirtbike. i have the vin and so forth , but the local bmv are clueless. maybe some one out there knows what i need to do. anyway here is my swap pretty much kept it all original except the engine. i need to find a cafe style seat tho or make one. headlight should be here soon.